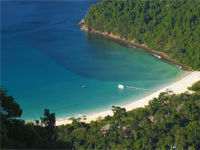 Mergui Archipelago, located in southern most part of Myanmar (Burma), comprises over 800 beautiful islands. Due to its virtual isolation, the islands and surrounding seas are alive with an amazing diversity of flora & fauna and very beautiful underwater scenes and marine life. Just north of the Surin Islands, an imaginary line divides Thai waters from Myanmar's Mergui Archipelago. Also known as the Archipelago, this immense area covers approximately 36,000 sp km (14,000 sq miles) and included roughly 800 islands. Diving here is still in its infancy, as the entire region has been off-limits to outsiders since the late 1940s. After several years of negotiation by Phuket dive operators, the archipelago was opened for tourism in 1997, yet much of the area remains unexplored. The islands are similar to their Thai counterparts, with rugged, high-profile limestone and granite topography. One obvious difference, aside from the sheer number of Myanmar islands, is their unspoiled terrestrial scenery. Dense brush and rainforest cover most areas above the high-tide line, while vast stretches of mangroves and magnificent white-sand beaches are interspersed with rocky headlands, tidal creeks and a few freshwater rivers. Though several of the larger islands are home to small communities of Moken 'sea gypsies,' the vast majority are uninhabited and largely untouched by humans. 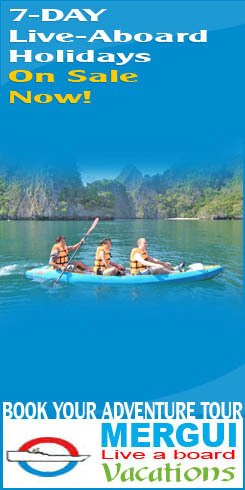 In addition to dedicated drive trips, several companies offer eco-adventure trips in Mergui Archipelago, combining sailing, snorkeling, diving, beach-combing, island exploration and, in some cases, kayaking. It is too early to say what this area's long-term prospects are, but hopefully, increasing interest in ecotourism will provide enough incentive for the authorities to take action and protect the reefs before it is too late.